The MMA fighter had a famous friend by his side. 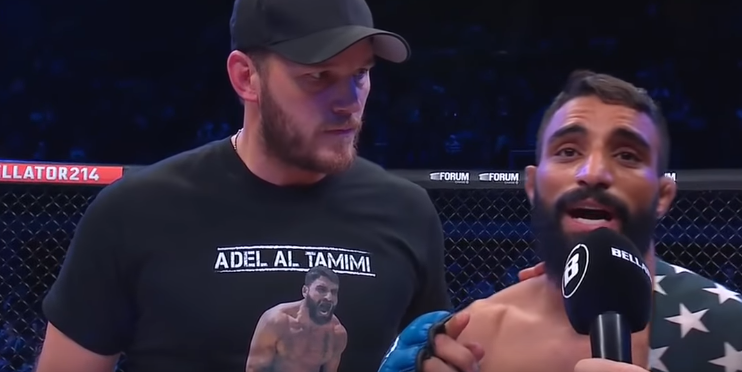 If you were watching Bellator 214, you undoubtedly noticed fighter Adel Altamimi’s ringside friend. Chris Pratt aka Star-Lord walked into the arena with his training partner into the ring before his fight with Brandon McMahan. Pratt’s support of the Iraqi-born fighter didn’t end there. Pratt celebrated in the octagon with Altamimi after he won by submission and was called a “brother” of the winning fighter. Altamimi’s story is pretty incredible. The 29-year-old was a contracted convoy driver for U.S. Marines in Iraq, where he was captured and almost killed by Al Quaeda. Thankfully, Altamimi was saved. He was eventually offered a multi-fight contract with Bellator, who partnered with the Merging Vets And Players program. Pratt is a huge MMA fan and friend to Altamimi. It’s fantastic he could be there for his friend’s big fight. I’d love to see what Pratt himself could do in the octagon.